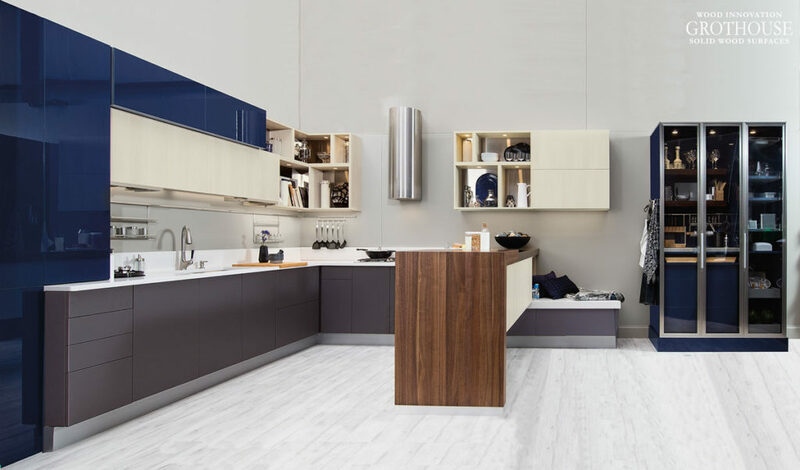 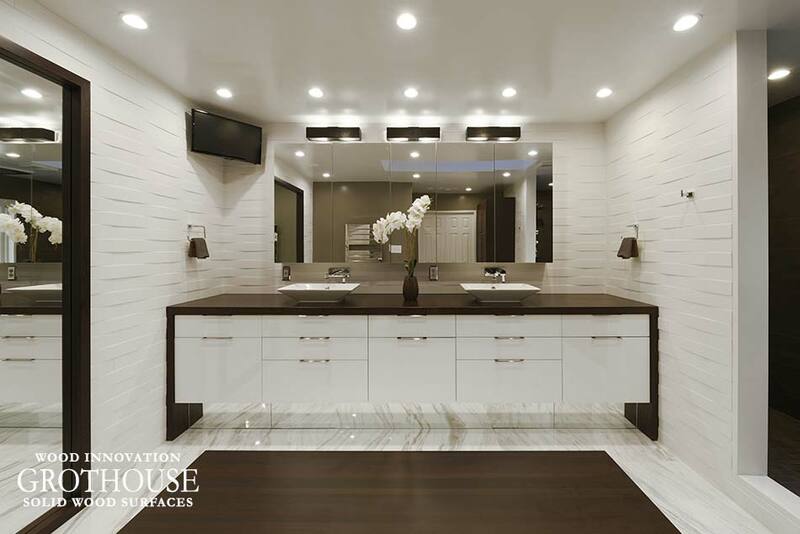 Sleek, clean lines and simplicity make modern kitchens a popular design choice. 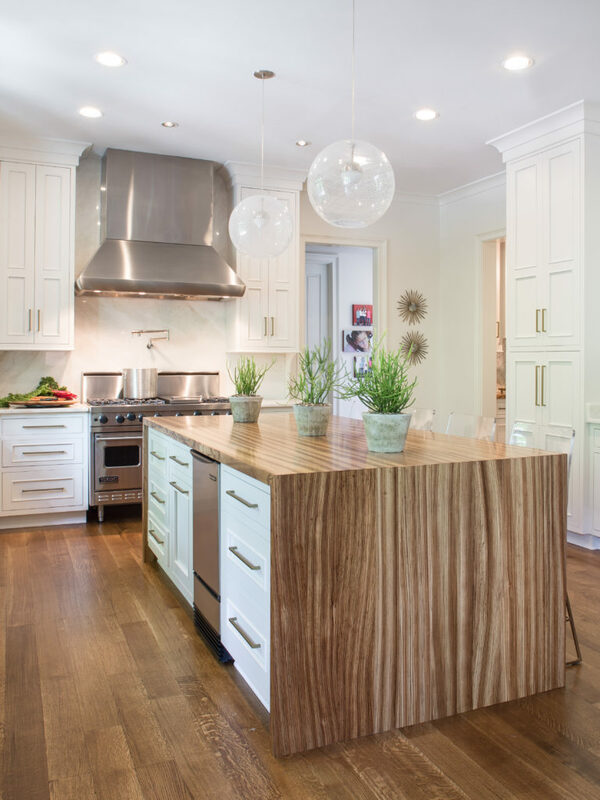 Because modern kitchen designs typically have more of a cooler feel, designers choose wood countertops to add warmth. 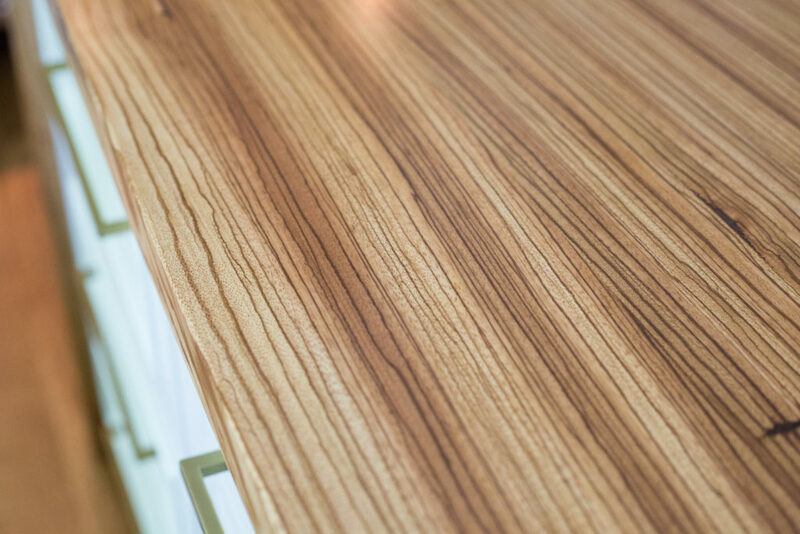 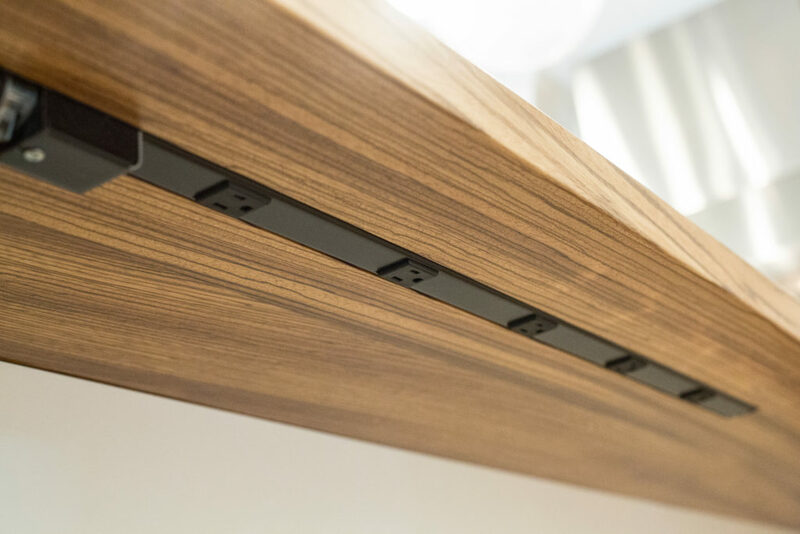 In addition to adding warmth, wood modern kitchen countertops can be custom crafted to feature a sleek and simple edge profile. 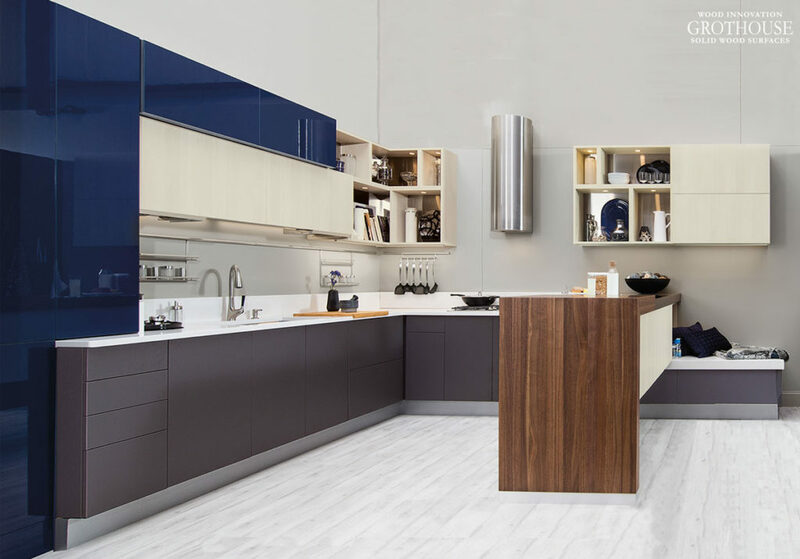 Below are designs by some of the industry’s best featuring wood for modern kitchen countertops. 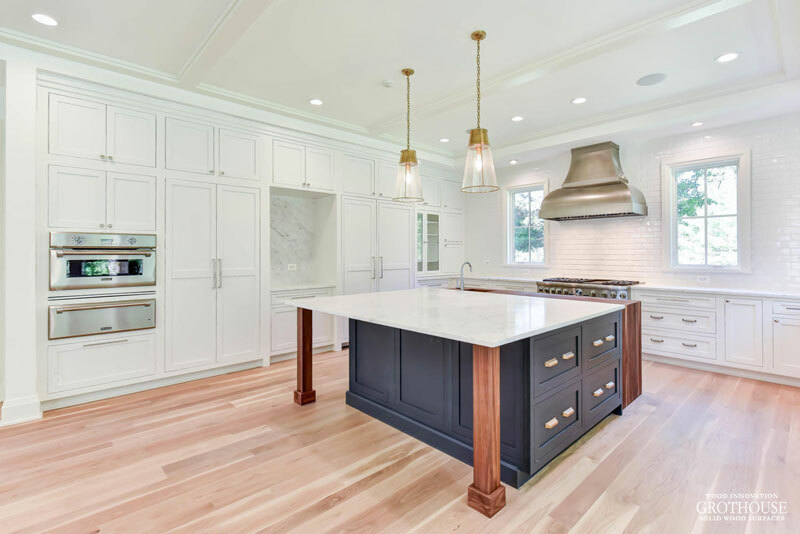 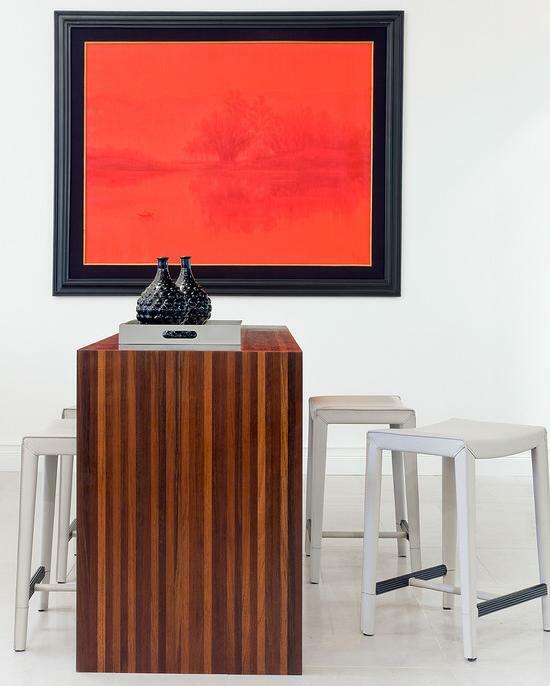 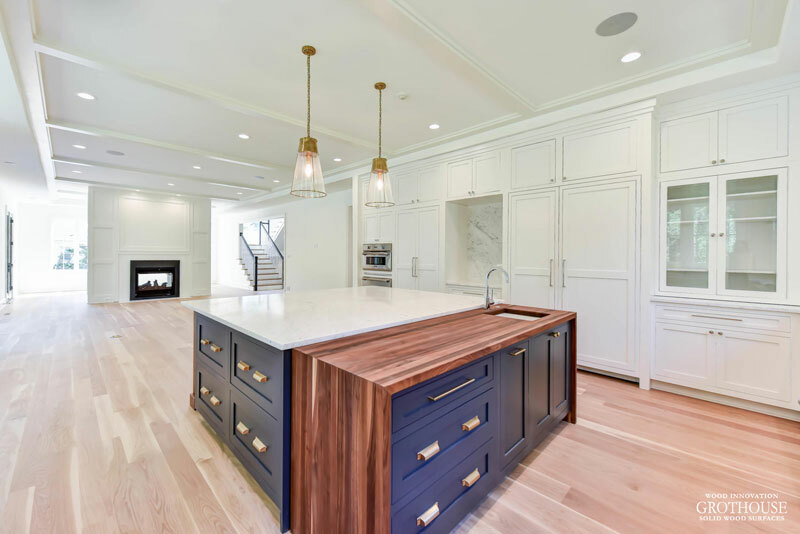 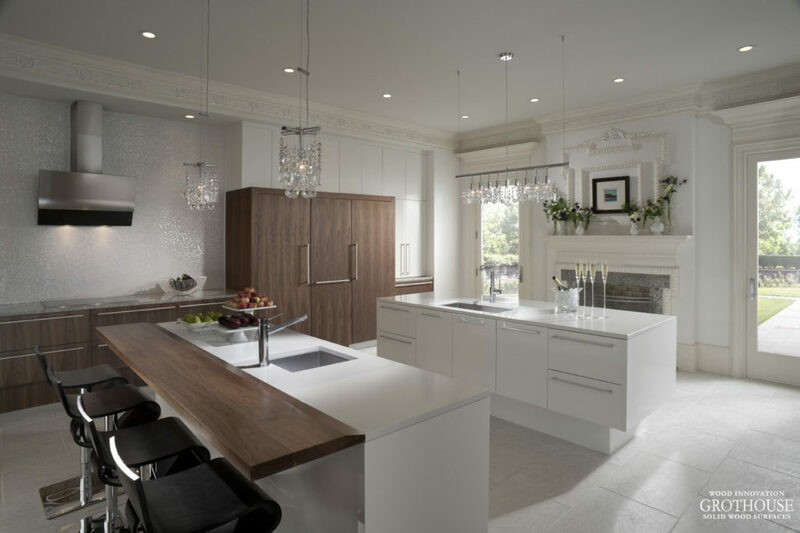 Paul Bentham of Jennifer Gilmer Kitchen & Bath designed a Peruvian Walnut Half Parsons Table for the 13 foot island in this modern kitchen design. 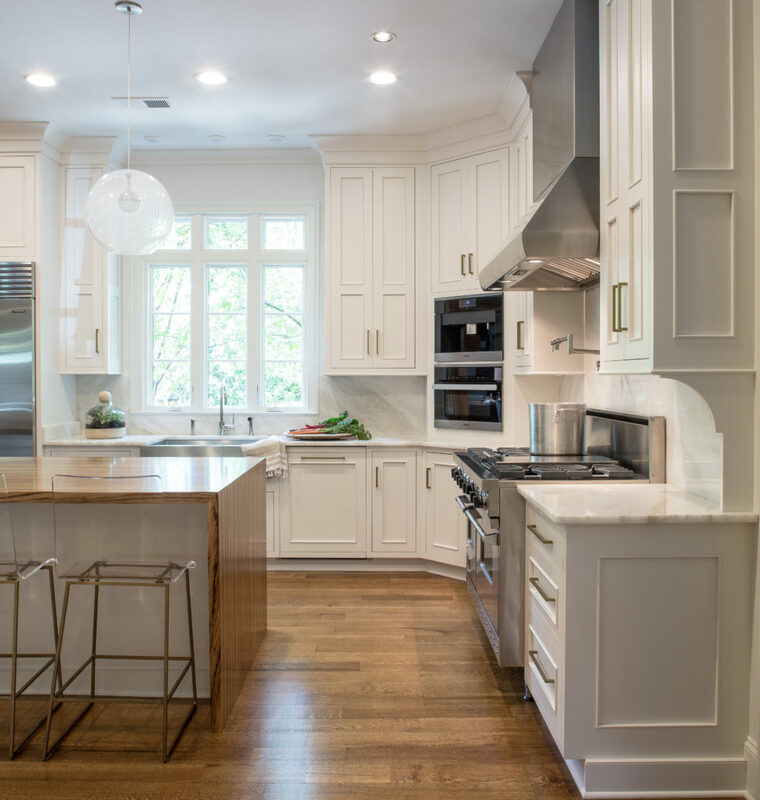 The countertop includes a cooktop and a perfectly balanced overhang to provide space for seating. 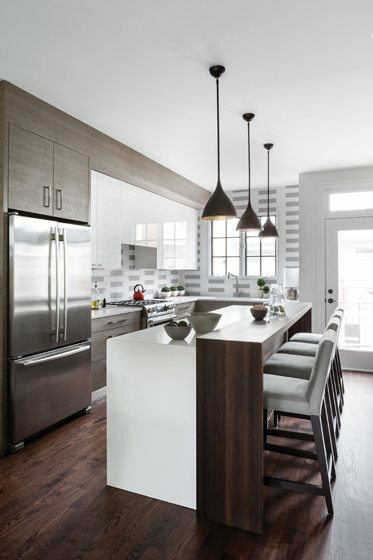 Photographed by Gordon Beall Photography, this gray modern kitchen design by Shawna Dillon of Studio Snaidero D.C. Metro won the Kitchen & Bath Business magazine’s Showroom of the Year 2016 Award. 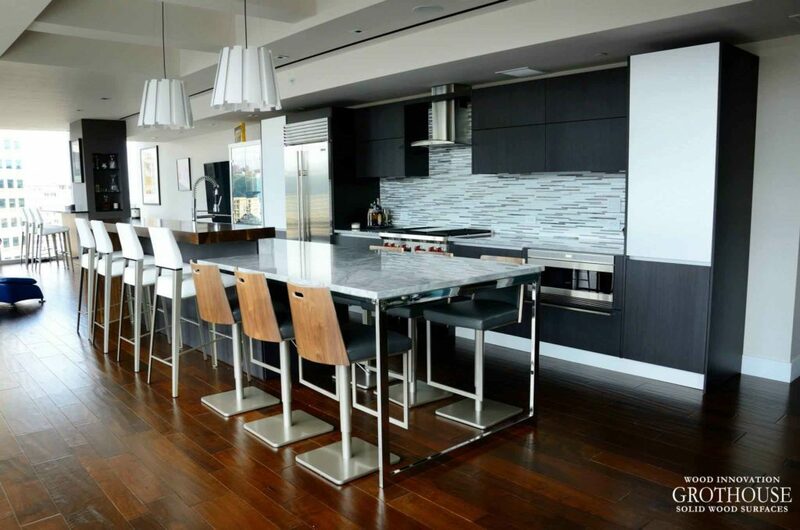 This award winning kitchen features a Stained Ash wood table top. 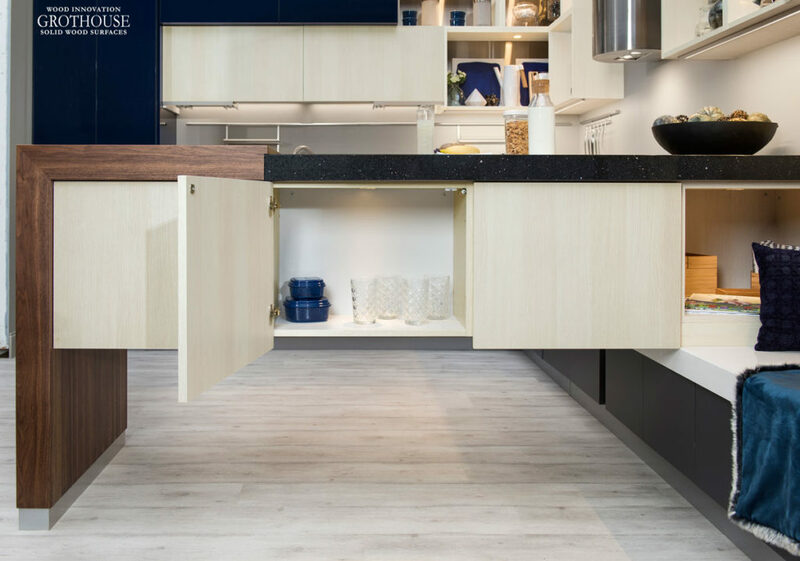 Nicklas Supply designed this cool-toned kitchen to include a Walnut Wood Pastore™ Countertop on the left side of the island. 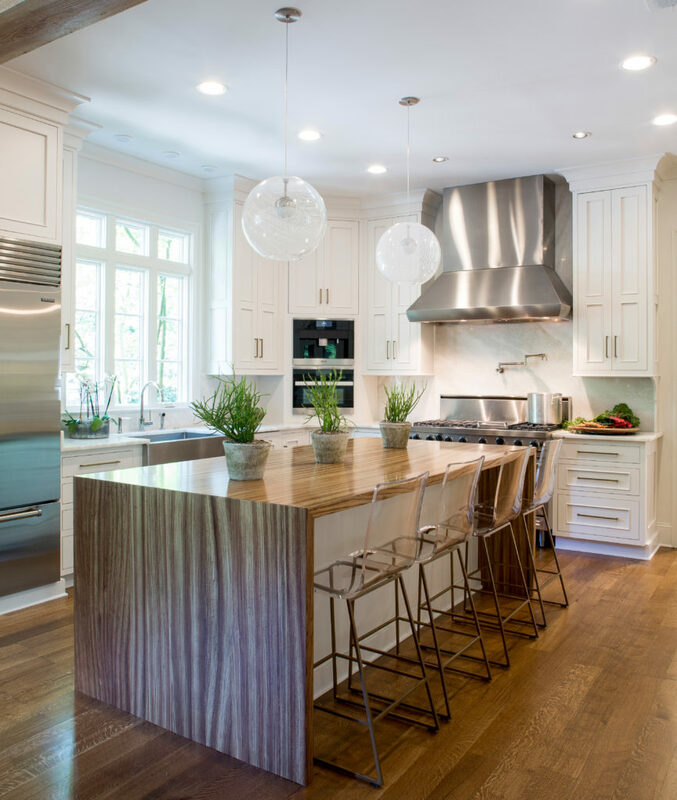 The warmth of the wood adds to the cool charm of this airy kitchen. 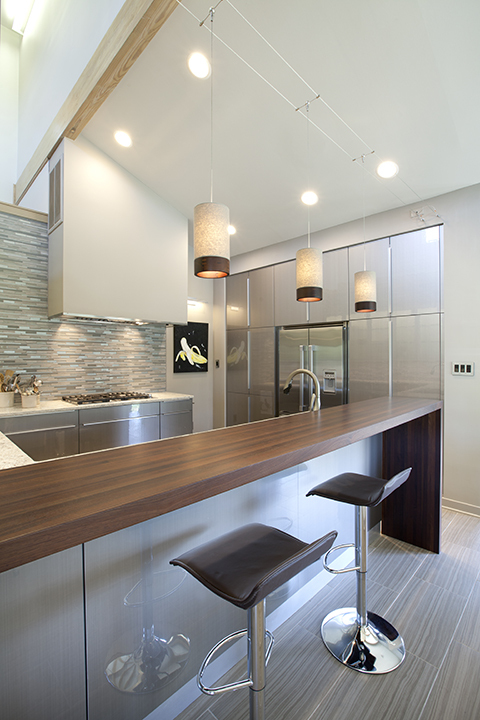 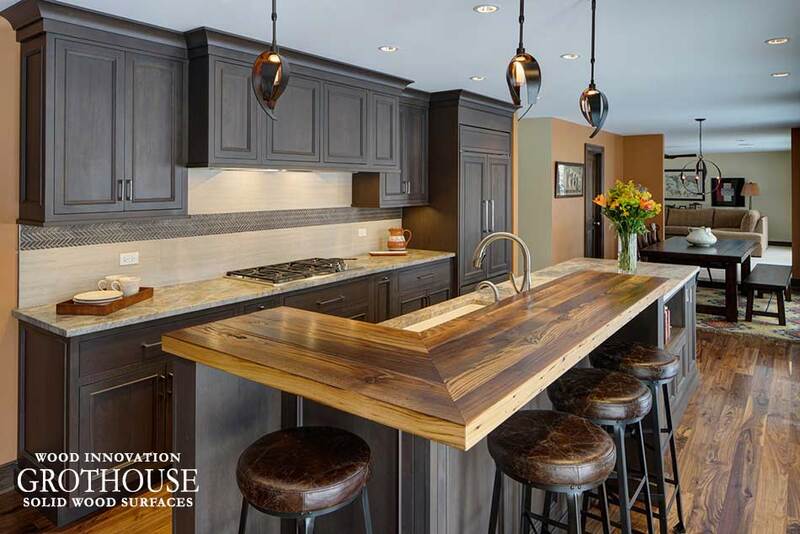 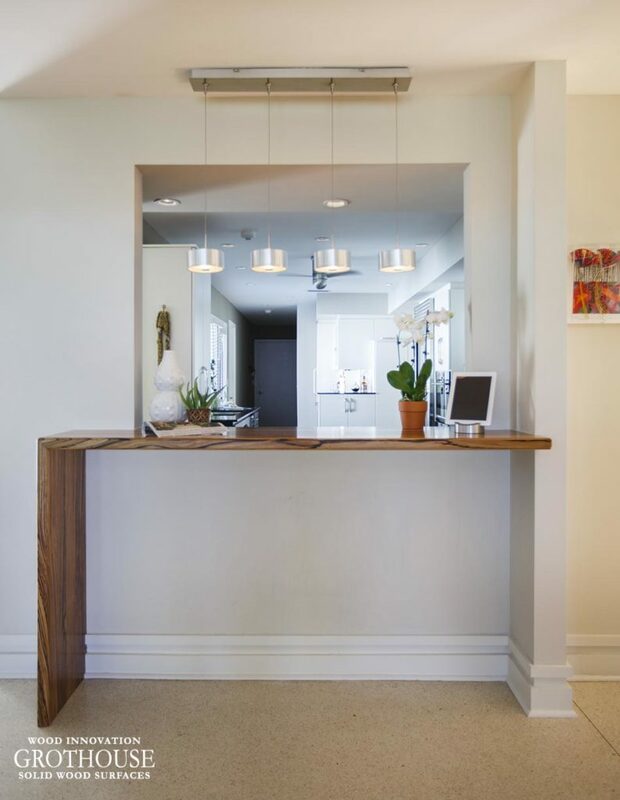 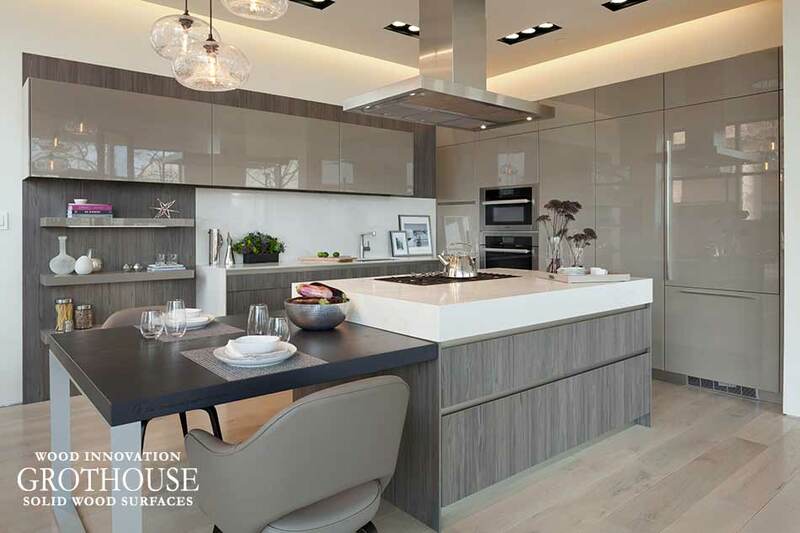 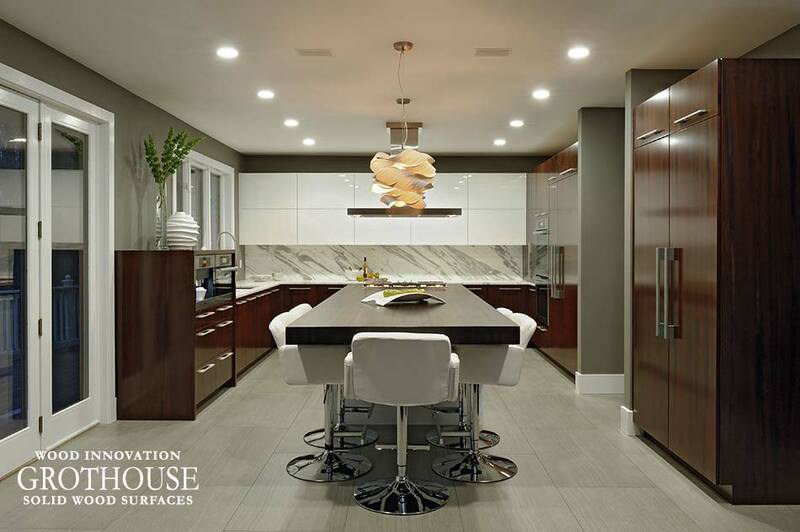 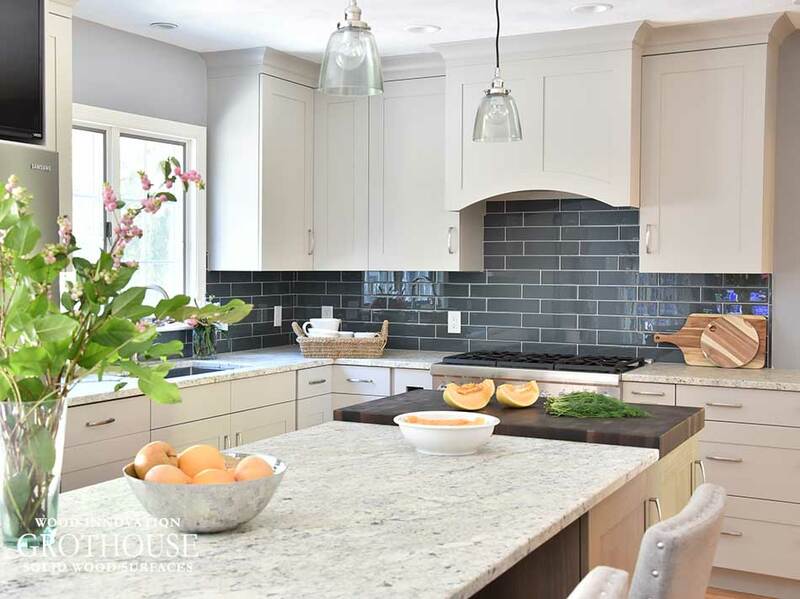 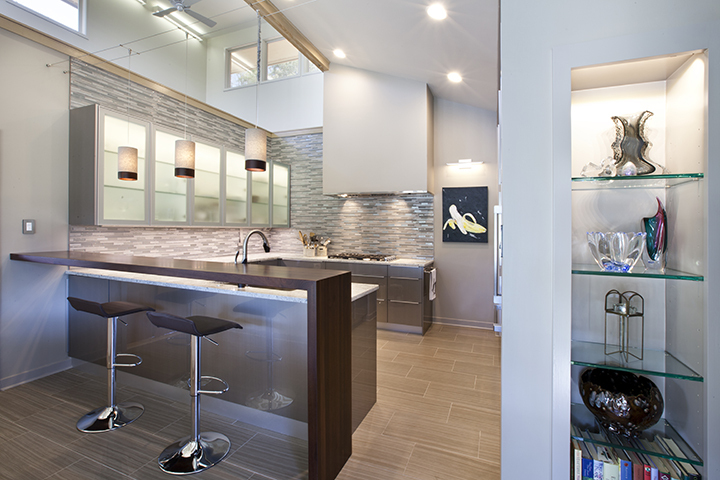 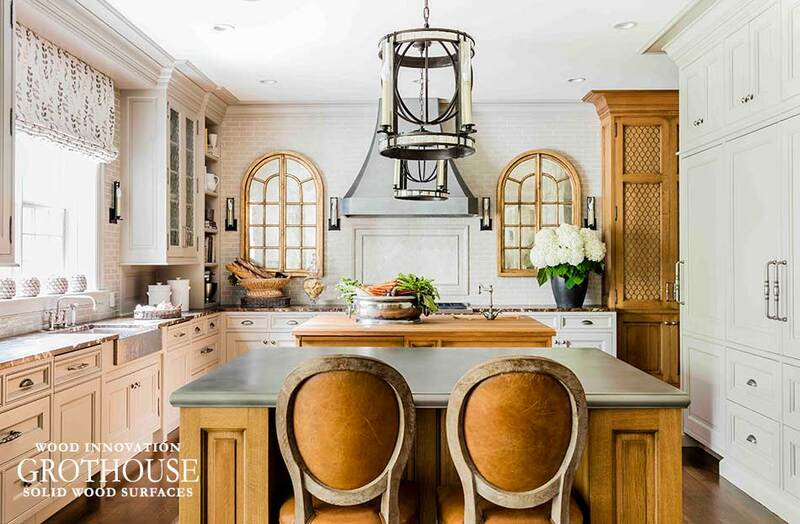 Lukejohn Dickson of La Source designed a Peruvian Walnut Pastore™ Bar Top for this neutral modern kitchen. 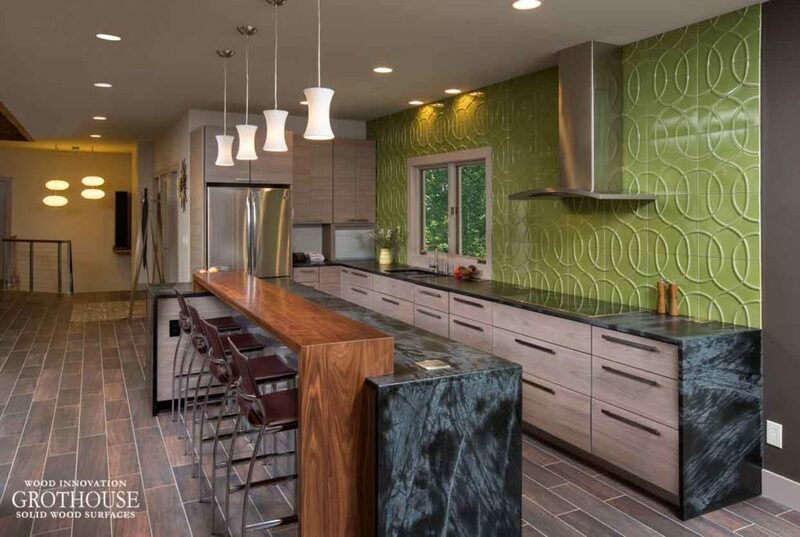 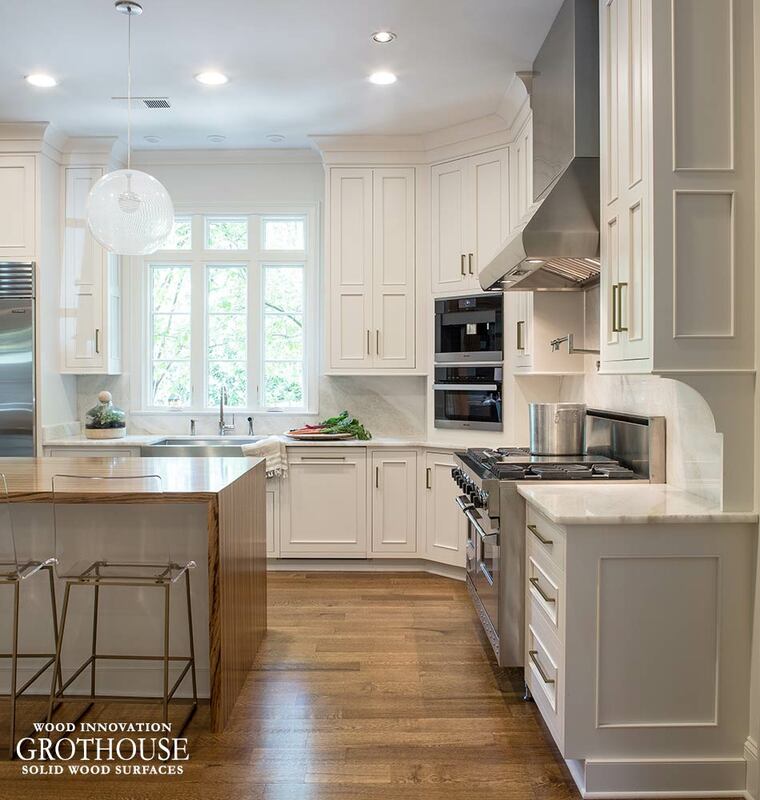 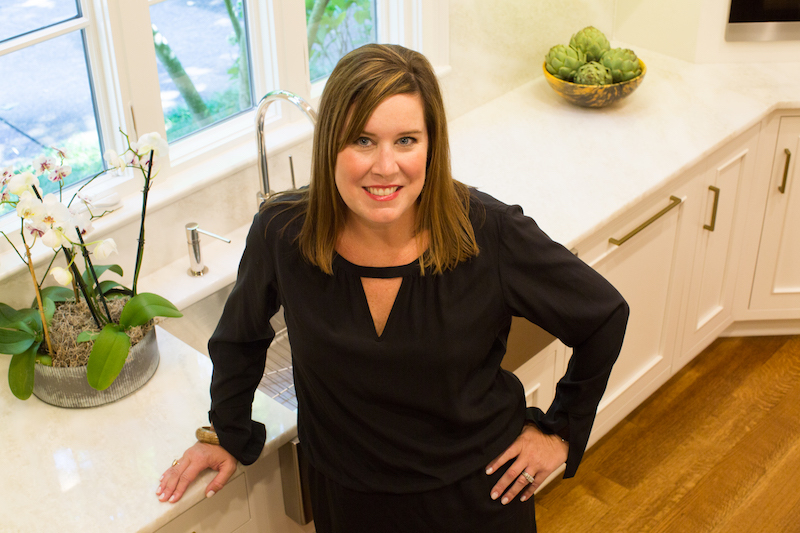 Griffey Remodeling also went with a Pastore waterfall countertop made of Walnut wood for their modern kitchen design featuring a fun green backsplash. 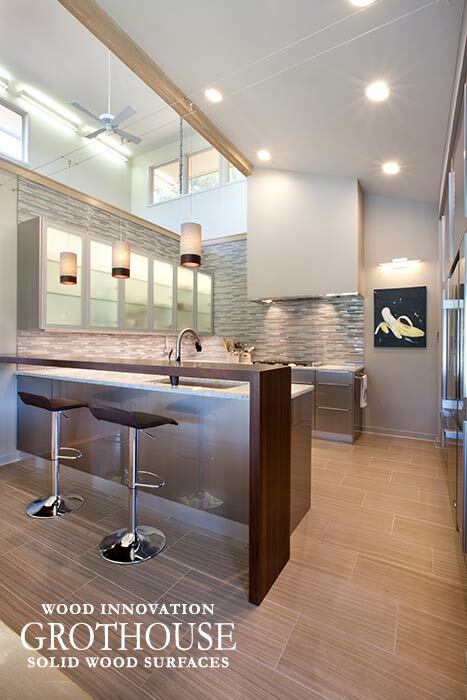 Want more modern kitchen countertops design inspiration? 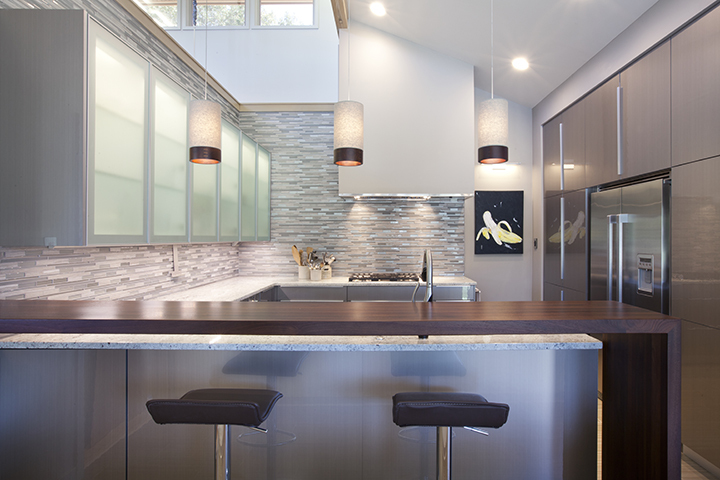 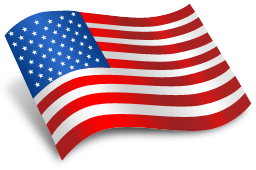 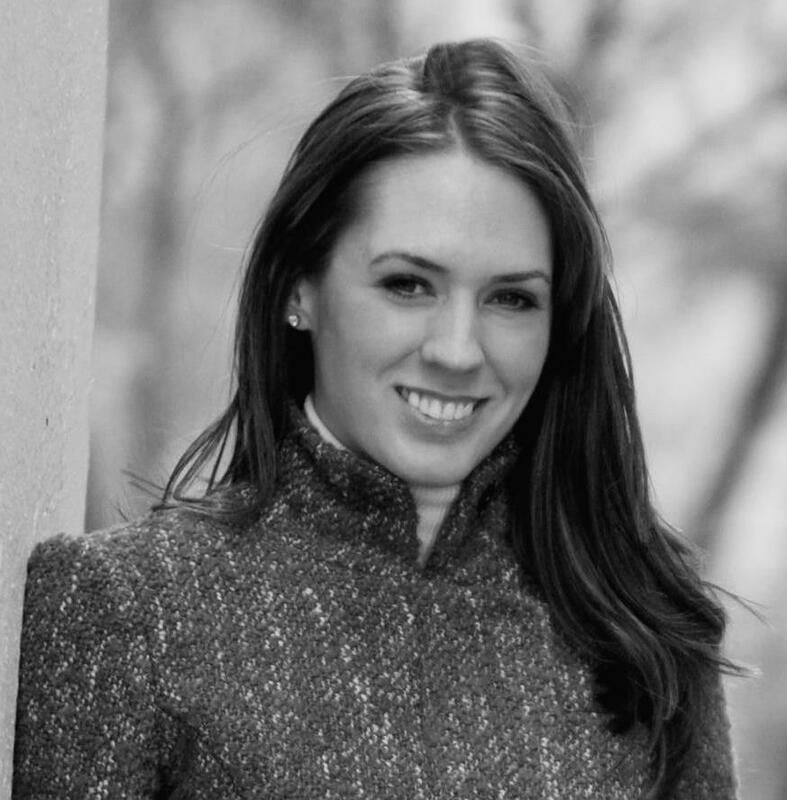 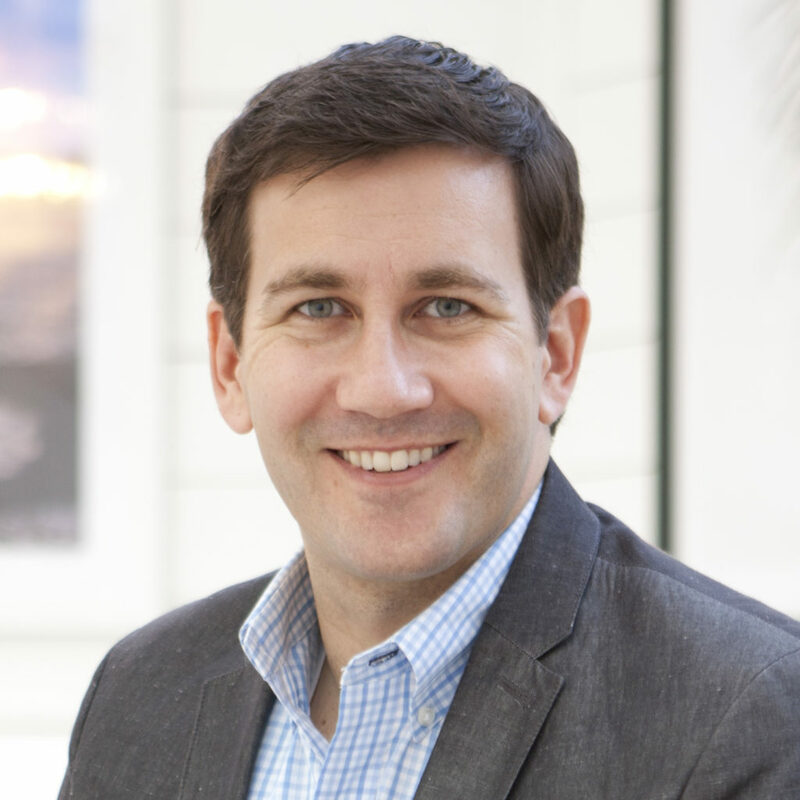 Check out our profile on Houzz.